Sequential WordPress theme is a nice theme particularly useful for business and corporate websites, with custom page templates. (Front Page Template,Grid Page Template, Full-Width Page Template). 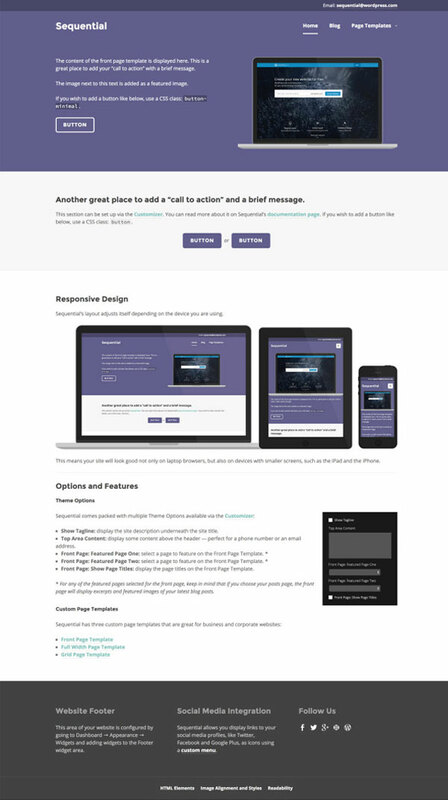 Sequential comes with two Custom Menus: one in the theme’s header and one in the footer. Sequential allows you to display links to your social media profiles as icons using a Custom Menu. Icons for Twitter, Facebook, LinkedIn and most other popular networks are included, and Sequential will automatically display an icon for each service if it’s available.